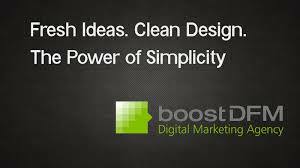 February 18th, 2014 (Sarasota, FL)—Combining the fresh ideas and clean design style of Boost Studio with the technological know-how and expertise of Digital Frontiers Media (DFM), boostDFM represents a singular creative agency for clients in Southwest Florida and around the world. The agency’s ability to deliver high-quality branding, website/app design and development, print design, copywriting, and media relations makes them one of the few truly full-service agencies for businesses across a wide range of sectors, from construction, tourism/hospitality, technology, consumer products and non-profits. As boostDFM, the new entity brings nearly six decades of expertise and experience creating both traditional and digital solutions for companies around the world. Their combined work has garnered multiple awards from the American Advertising Federation (ADDY) as well as the Council for Advancement and Support of Education (CASE) and has been featured in LogoLounge Master Library Series which showcases the country’s best logo design.